The 1968 “Planet of the Apes,” written by Rod Serling, became a classic, spawning several sequels. When I heard that a new, re-imagined version, “Rise of the Planet of the Apes,” was scheduled to open in 2011, I was not interested initially. However, it received good reviews and had strong word-of-mouth. So I went to see it, and thought it liked it very much. 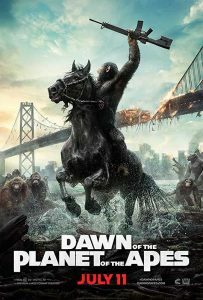 This summer brings us the new film in the series, “Dawn of the Planet of the Apes.” It is indeed a worthy successor to Rise. Rise concluded with the intelligent ape Caesar, who had been trained to understand language by a sympathetic scientist, escaping sadistic captors by fleeing San Francisco with other primates by crossing the Golden Gate. In the meantime, a deadly, fast-spreading virus was decimating the human race. This set the stage for a civilization of intelligent apes surviving on earth while the human race dies out. 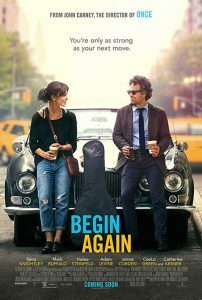 “Begin Again” is written and directed by John Carney, who gave us the wonderful independent movie “Once” in the Summer of 2007. That story of street musicians in Dublin went on to become an Oscar-winning film, and now a Tony-winning Broadway musical. “Begin Again” is also a story of musicians, with long sequences devoted to recording music. Also, like “Once,” “Begin Again” features interesting characters that you will come to care about. “Begin Again” takes place in New York, rather than Dublin. Dan (Mark Ruffalo) is a music industry executive whose life is in shambles. Dan is estranged from his wife, Miriam, and teenage daughter, Violet. Changes in the music business, along with his inability to find new talent have all taken their toll on Dan. Even though he still drives a Jaguar, Dan is living in a small, seedy apartment building, apparently broke. Renowned artist Mickey O’ Neill McGrath, OSFS will present “Drawing Close to God: Creating Prayer Mandalas” Aug. 15–17 at the Dominican Retreat and Conference Center in Niskayuna, New York. With Hildegard of Bingen as guide and inspiration, participants will use basic materials and simple shapes to discover inner peace and the presence of God. No prior art talent or experience required. Br. Mickey’s work and ministry have been featured in the St. Anthony Messenger, USA Today, and many Catholic newspaper articles around the country. Several of his covers for America Magazine have been given awards by the Catholic Press Association. He creates art for many of today’s leading Catholic publishers, including the U.S. Conference of Catholic Bishops. For more information or to register, visit www.dslcny.org. If you don’t see your congregation listed here, and you have sisters who are celebrating anniversaries this year, please send this information to editor@domlife.org, and it will be published in the next edition of Dominican Life. Sinsinawa Art Gallery, Sinsinawa, Wisconsin, will host “Nature: Water and Wonder” Aug. 12 through Sept. 30, 2014. The show will feature the work of two Iowa natives, glass art by Barb Zehentner McKinlay and photography by Stephanie Funke. An opening reception will be held Friday, Aug. 15 from 6 to 8 p.m.
Zehentner McKinlay captures a lifetime of memories of living along the Mississippi River, layered upon one another: the sounds of breaking ice, the bubbles that signal the underwater passage of aquatic wildlife, the smells and textures of backwater algae and mosses, the colors of the changing seasons. She works by hand to create pieces reflective of the river on a base of clear glass with layers of hand-made cubes or bubbles flowing with ground glass (or “frit”). The cubes or bubbles are formed by firing first, then multiple additional firings fuse the pieces and frit to the desired texture and “slump” them into their final forms. “This work explores the images of my mind’s eye remembering the places and times I have spent along this beautiful and unique landscape,” she said. Much of Funke’s work is of the outdoors as she is easily captivated by the overwhelming power, beauty, intense extremes and profound lessons of nature. Patterns, lines and the presence and/or absence of light also influence her images. When photographing the world outside her door, she is amazed by the endless opportunities to capture the predictable as well as the unexpected, bizarre and often overlooked elements of nature. This collection of photographs combines various regional landscapes along with scenes from hydrothermal features in Yellowstone National Park to highlight some of Mother Nature’s amazing and naturally charming attributes. For more information, contact Michelle Till at 608-748-4411 or visit www.sinsinawa.org. Sinsinawa Mound, the motherhouse for the Sinsinawa Dominican Sisters, is located in southwest Wisconsin on County Road Z, off Highway 11, about five miles northeast of Dubuque.